Bergevin Lane is a great little winery out of Walla Walla Washington that was established about 10 years ago by Amber Lane and Gary and Annette Bergevin. They produce about a dozen or so different wines and this is their Columbia Valley Cabernet Sauvignon. 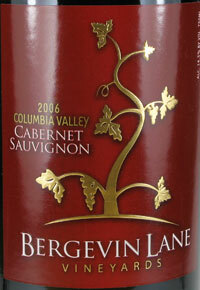 The 2006 Bergevin Lane Columbia Valley Cabernet Sauvignon is composed of 76% Cabernet Sauvignon; 16% Merlot; 5% Cab Franc; and 3% Petit Verdot sourced from vineyards located in Washington's Columbia Valley. The wine was aged in French (76%), American (17%), and Eastern European (7%) oak barrels. It's a 925 case production. On the nose I get beautiful, room-filling aromatics of ripe black cherries, coco powder, cracked peppercorn, and subtle hints of dried herb and vanilla. It's a very well developed and sensuous bouquet that I think has been benefited from some additional bottle age. On the palate this wine is incredibly smooth and silky, with fully integrated tannins, and flavors of dried herbs, blackberry, peppercorn, vanilla, dark chocolate, prune, and cedar box. The use of American and Eastern European oak; although very slight, is quite noticeable on the palate.